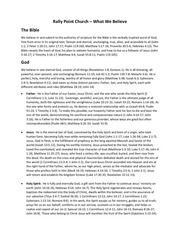 This PDF 1.5 document has been generated by Corel PDF Fusion v1.0 / eDocument Library version 2.6 PDF Filter, and has been sent on pdf-archive.com on 28/05/2013 at 08:01, from IP address 112.210.x.x. The current document download page has been viewed 1431 times. to be viewed as ruling over the whole church. devout Anglican ministers, sparks Great Awakening. 1784: USA Methodists form separate church body. America established in Providence, Rhode Island. 12 million or more, USA. Apocrypha) and 27 books for the New Testament. infallible. The standard Protestant canon is accepted. Trinity (Father, Son, and Holy Spirit). heaven, and will come again in glory to judge us all. works of love and receiving Penance and the Eucharist. forgives us through faith in Christ, who died for our sins. not obtain forgiveness or salvation. our right standing before God. average once every four years). believers and whose officers are pastors and deacons. cooperative purposes, especially missions and education. memorial of Christ’s death and anticipation of his return. Church and is considered an object of devotion and veneration (a show of honor that stops short of worship). disagree with all five points of Calvinism. Most Baptist bodies emphasize evangelism and missions. pluralist beliefs contrary to church teaching. Baptists (1.5 million) and the National Baptists (5-8 million) are mainline churches. Churches. Available as a pamphlet, PowerPoint, wall chart, and in the reproducible book: Rose Book of Bible Charts, Maps &amp; Time Lines VOL 1. This file has been shared by a user of PDF Archive. Document ID: 00106950.